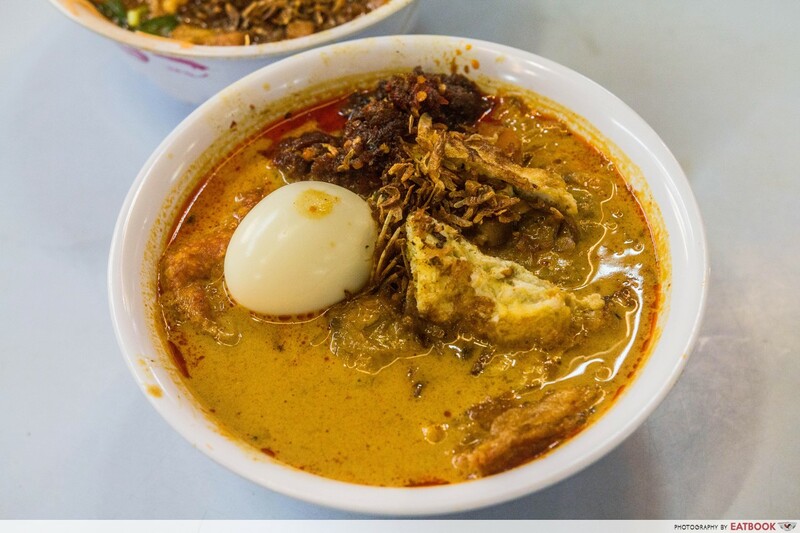 It is not often you hear someone rave about their favourite, or the best, mee siam or lontong. 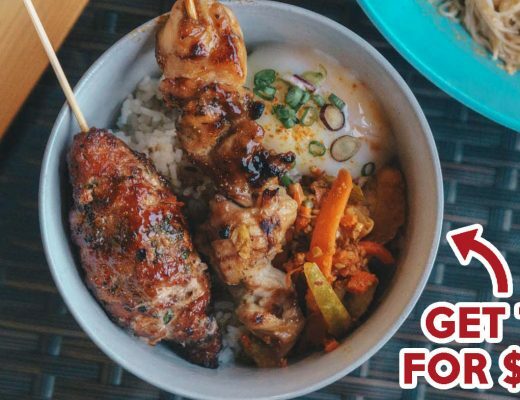 Dishes such as chicken rice, laksa, and nasi lemak, on the other hand, they have long been in the limelight, and also in the minds of many Singaporeans as time ticks towards lunch. However, you have to trust me when I say, that nestled in the silver estate of Redhill lies a hidden hawker gem, Jia Xiang. When my good friend told me about “this damn good mee siam and lontong stall” I have to try, I was doubtful that mee siam and lontong could taste that much better than those I’ve tried thus far. 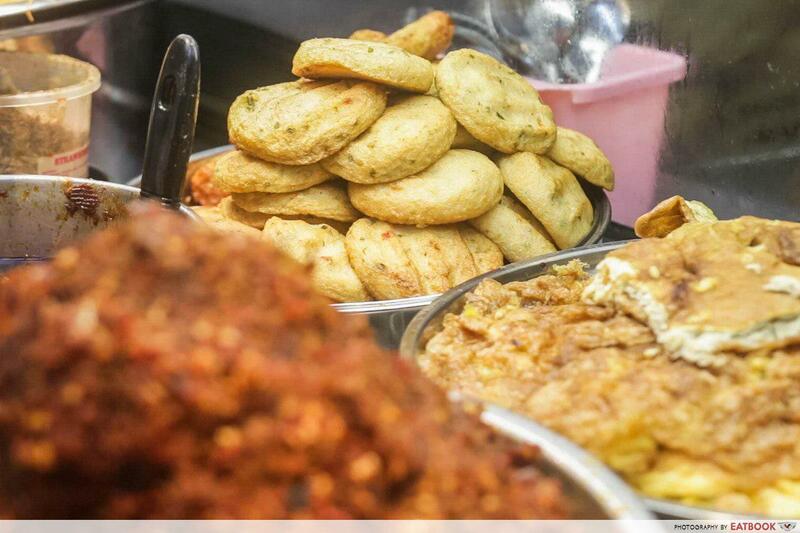 However, as I approached the stall, my eyes started to dilate as I saw mountains of delicious-looking food. All I was expecting were two simple cauldrons of broth, bee hoon, and a handful of toppings. Nothing was going to put me off having two bowls to myself here. 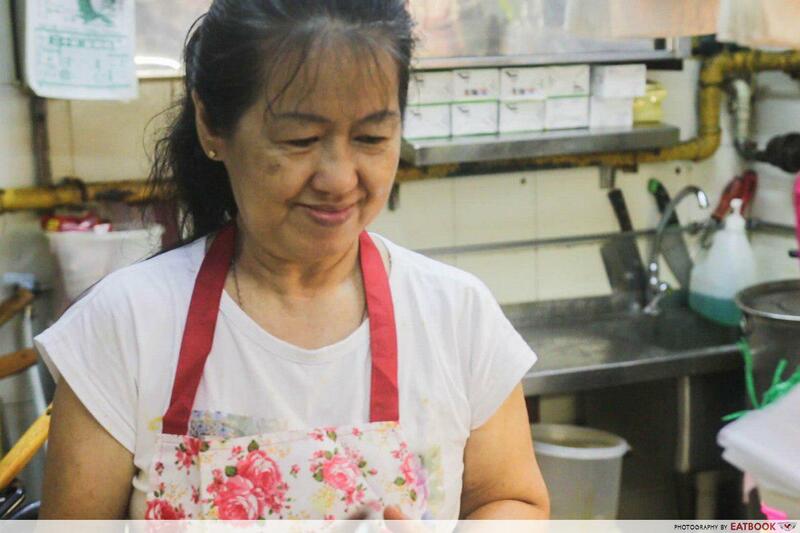 Mdm Chen Mei Ying, 63, started helping her mother fervently every day since over 50 years ago. The stall was at the very same Redhill Food Centre which they are currently still at now. She was only 12 when she had to help with the ins and outs of the stall. Like any child that age, she was reluctant to help out but did it out of pure filial piety. She lamented how much she hated it when her mother badgered her to help out at the stall. As a daughter of a hawker myself, I know full well the feeling of frustration – you are torn between helping your parent out as a filial child should, and going about with your usual “business”. 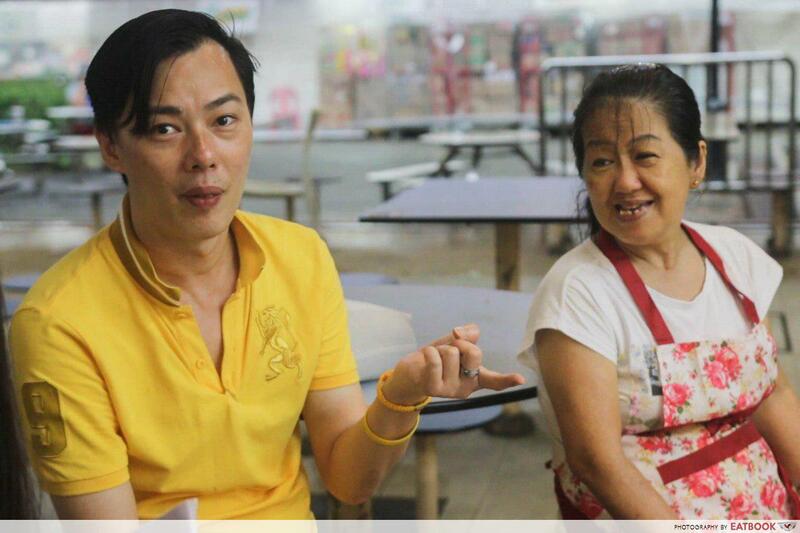 Life has its own humorous way of teaching lessons; Mdm Chen is now in the exact same situation as her own mother, wishing her son would be the third-generation hawker and take over the running of the stall. Mdm Chen’s source of joy stems from her customers. She loves seeing them enjoying her food and is even more satisfied when they savour the dish to the very last drop of the broth. Whenever she mentions celebrities who come to her stall, her eyes sparkle as well. These little bouts of joyous occasions really fuel her passion to continue the tough but rewarding job of a hawker. 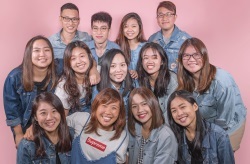 I could tell from the motherly grin paired with her adorable smize, that Mdm Chen is a very positive and cheerful individual. When asked about her daily struggles, she mentioned that there wasn’t really that much of one. I tried probing further, asking if there are any times that she felt sick, she replied that she does not let it bother. She does not ask for a day of rest as she feels responsible to cook for her faithful patrons. A usual day for the mother and son duo starts from 7am. Knowing that their working customers love taking away a packet or two for lunch or even dinner, they prep their ingredients early every morning to keep them fresh. Mdm Chen takes pride in looking out for their customers. Her son chimed in about how they keep the sugar and salt levels down as well, just to suit the dietary needs of their elderly customers. Their customers seem to always be on their minds. 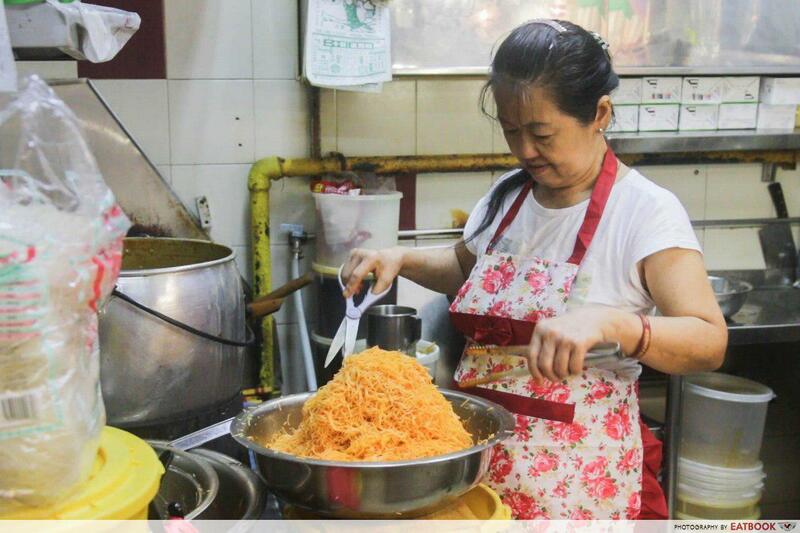 The broths for the mee siam and lontong take them three full hours to prepare. 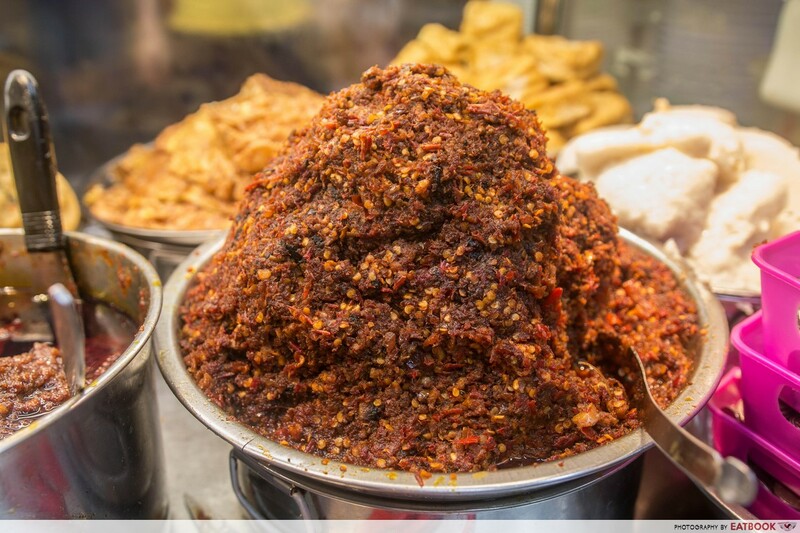 Other ingredients such as hard-boiled eggs, fried eggs, tau pok, tau kwa, rice cake, ngo hiang, fried croutons, belachan, and sambal are prepared in-house as well. They are then displayed like mountains under the orange glow of spotlights. These ingredients are generously doused onto their signature dishes, making them the most zhnged-up mee siam and lontong I’ve ever seen. I mean, have you ever seen both chilli and eggs made two ways for mee siam or lontong? I haven’t. 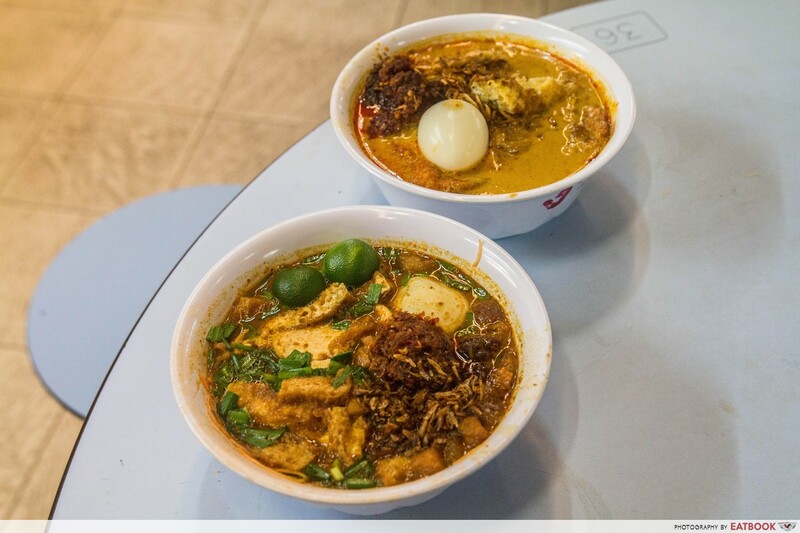 We got the only two dishes that are served at Jia Xiang – mee siam and lontong, both priced at a reasonable $3 each. When the steaming bowls were presented to us, we were in wide-eyed amazement. Such a myriad of ingredients was scattered atop that the bee hoon and rice cakes were fully hidden. I spied with my eyes, a full hard-boiled egg, chilli done two ways, dried shrimps, croutons, fried ikan bilis, thick fried egg, tau pok, tau kwa, lime, and a good scattering of spring onions. Tasting all the ingredients prepared painstakingly by Mdm Chen and her son, I can safely say paying $3 for this really offers bang for the buck. The fried croutons are commendable. They are different from the ones you find on your salad; the ones which stay rock hard despite being soaked in sauce, scratching the roof of the mouth. The ones here hold a slight crunch, bursting with flavours from the slightly tangy, sweet and fragrant broth. I thoroughly enjoyed the belachan as well. It is sweet, salty, spicy, and fragrant all at the same time. In an instant I am back at home, eating plain rice with belachan freshly pounded with a pestle and mortar by my domestic helper, who learned the ropes from my grandmother over 20 years ago. This modified lontong also impressed me. Similar to mee siam, the carbohydrates of the dish – the rice cakes – are hidden under a variety of toppings. 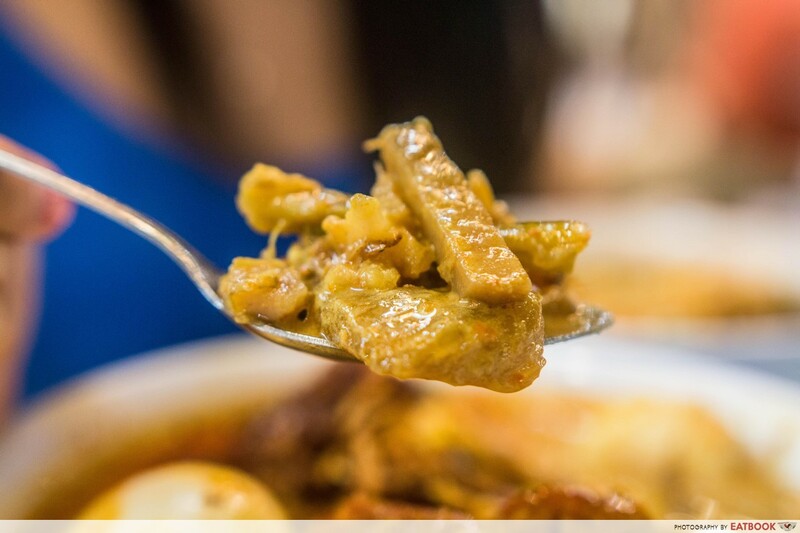 What sets their lontong apart from the rest is the added medley of julienned vegetables such as carrots, yam, and cabbage. This host of healthy greens provides a richer mouthfeel with its different crunch and textures. It juxtaposes nicely with the soft and slightly chewy rice cake. 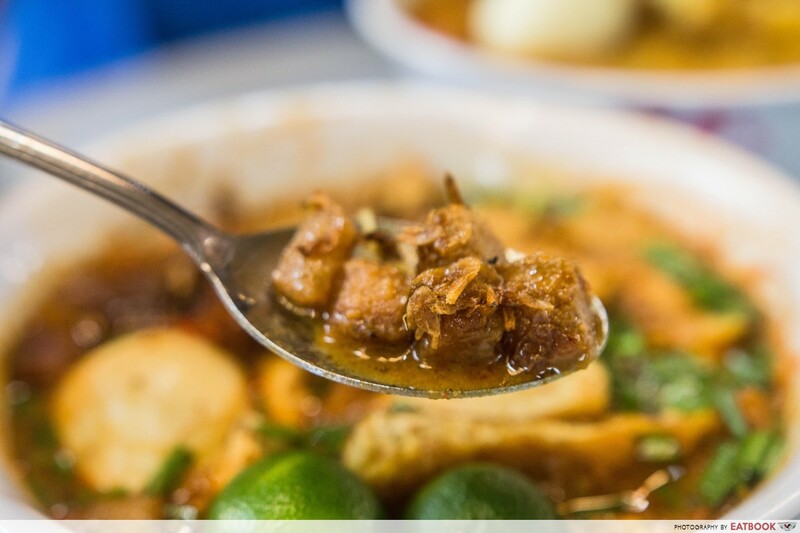 When paired with the aromatic coconut curry, is a taste hard to forget. 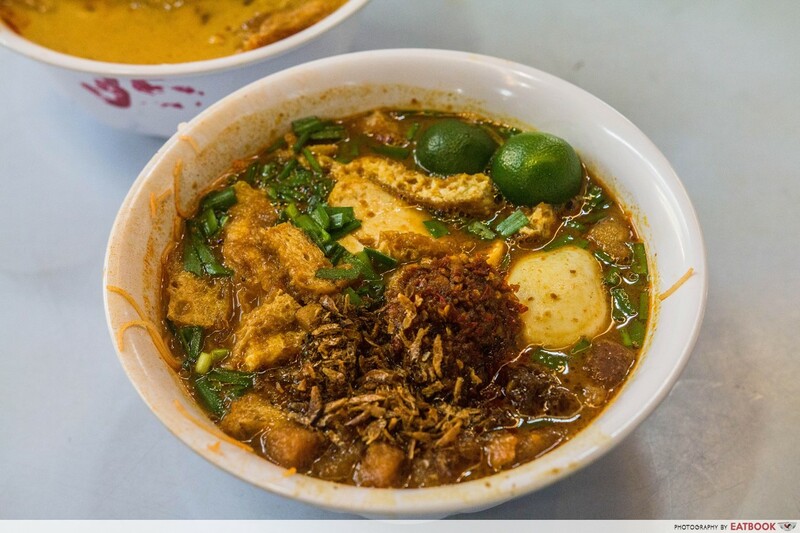 I recommend eating this with a spoon – old-school laksa style – and finish up the zhup. It would bring a smile to Mdm Chen’s face! The two dishes were indeed as good as they looked. My colleagues and I could feel the love through the food cooked by Mdm Chen and her son. It is truly food for the Asian soul, from the soul of this mother and son duo. 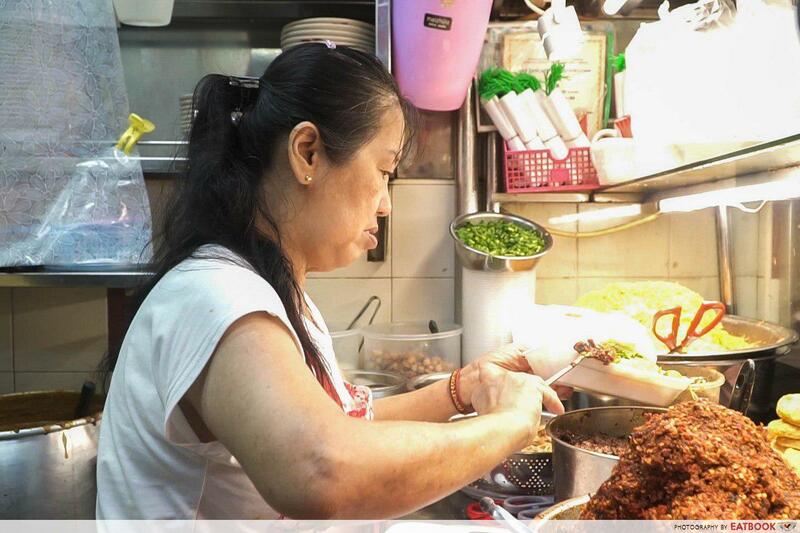 From the words of the hardworking Mdm Chen, “Being a hawker requires a lot of sacrifices, effort, and time.” Despite being 63 years-old, she still puts her best foot forward and works fervently every day to provide the best-tasting dishes for her loyal customers. And her efforts have evidently been reflected in the food she serves. This is a testament the younger generation, myself included, needs to replicate. I highly recommend visiting this stall as it is at a relatively centralised location of Singapore. 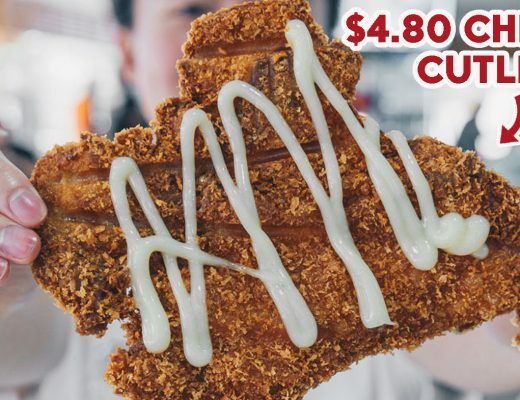 Bringing friends from overseas here to have a taste of these two dishes seems like a good idea as well. They are only mildly spicy! I’m sure many would love it. 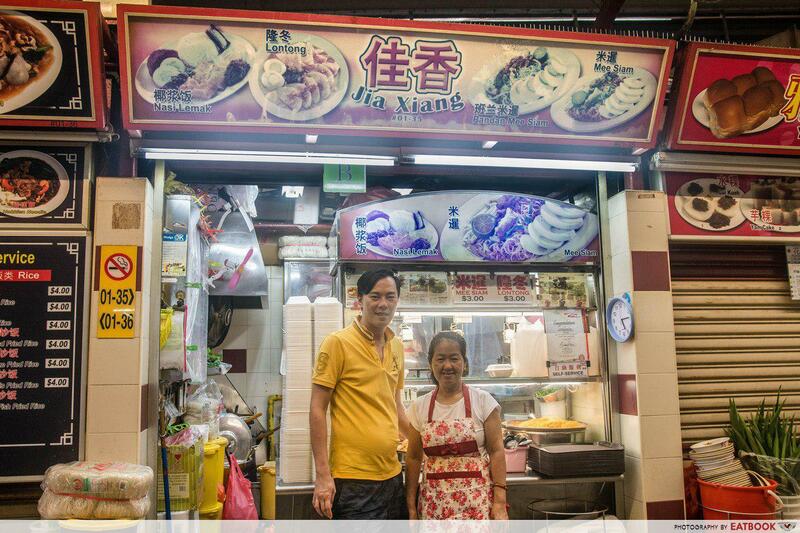 For more stories about hawkers in Singapore, check out these new-generation hawkers or old-school hawkers!